There can rarely have been a more popular winner of the Pat Trainor Award for Lifetime Contribution to Primary Schools Gaelic Games than PÃ¡draig Ã CathÃ¡in. 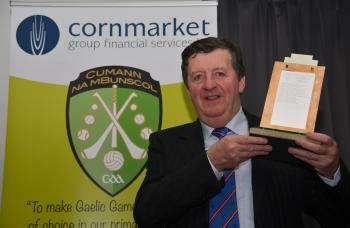 The genial Duagh man was honoured at the Cumann na mBunscol Awards in Ballincollig and was presented with his award by Ãine McGlinchey, daughter of the late Pat. reformed in 1994 Paddy was elected secretary, a position he held until 2011. 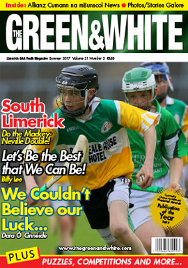 Paddy served on Coiste na mBunscol na Mumhan for eighteen years and was also Kerry delegate to Cumann na mBunscol NÃ¡isiÃºnta. A loyal worker for the cause of Duagh, Feale Rangers and Kerry, it was a proud moment for Paddy when his former pupil Anthony Maher won an All Ireland medal with Kerry in 2014 and brought the Sam Maguire back to Duagh. Chomhghairdeachas Paddy.